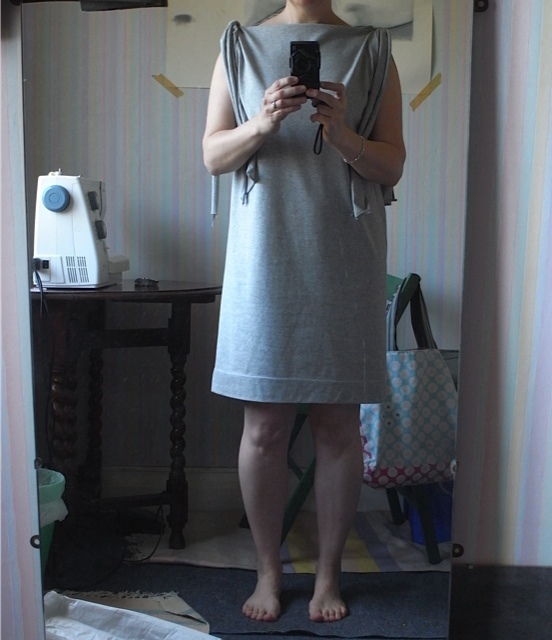 May 2014: The joy of Jersey & evolution of a dress! OK peeps, settle in, this is gonna be a long one! In fact I’ve made four. two in the khaki green, one grey and one navy. 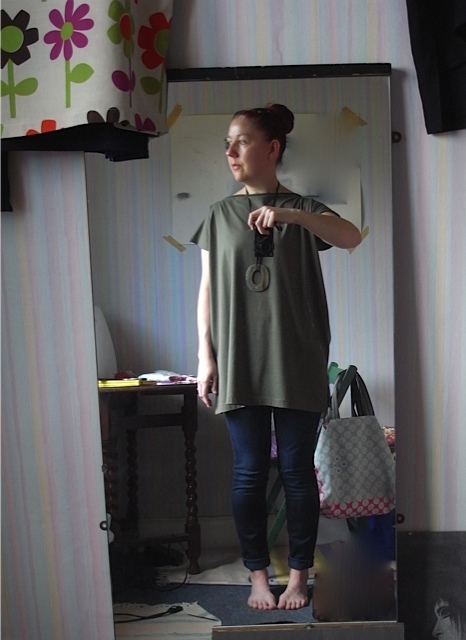 I absolutely adore this style of tunic, for many reasons. Its comfortable to wear, and in the jersey fabric it drapes so beautifully and feels really good on. Also with my love of simple sewing (& limited ability), the jersey, coupled with the simple shape actually makes this style look quite stylish. I don’t have any decent pictures of the other tops so you’ll have to make do with just the one, but basically its quite safe to say the other three look almost identical. I have a holiday coming up very soon, and need some dresses, just simple loose dresses. 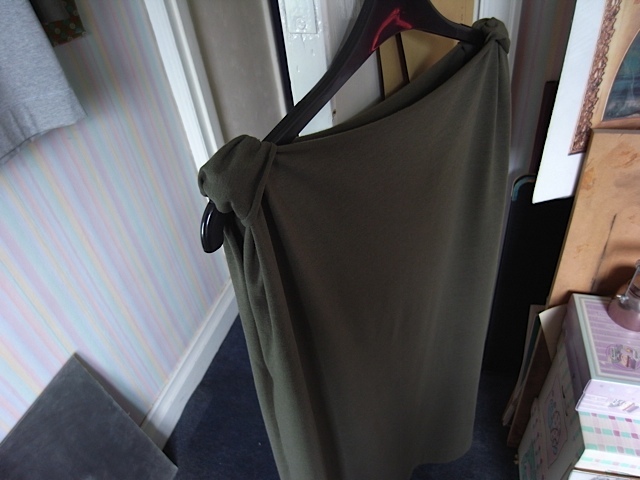 Nearly bought a few jerseyish (I’m aware its not a proper word) drop waist dresses from TopShop, but since I’ve started making some of my own clothes, I can’t justify £15 on an inferior quality item, when I have fabric at home that I paid £4 a metre for. Life would be easier if I could, as I would have bought four of the dresses and had a bank holiday weekend instead! So I decided I had to make them. 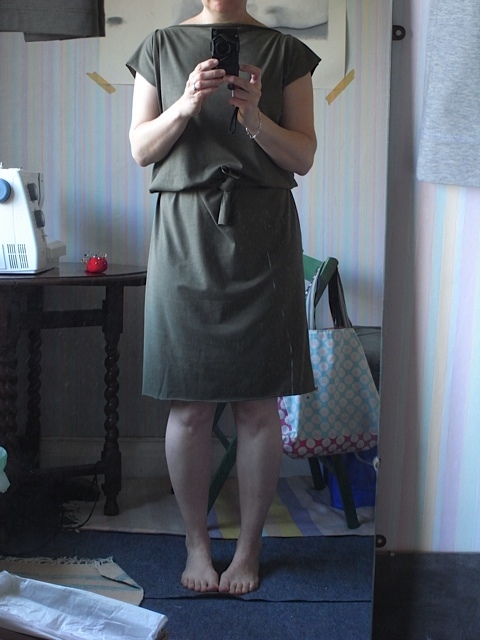 And therefore spent the entire bank holiday in my sewing room, and lets not pretend that I didn’t love every minute of it. 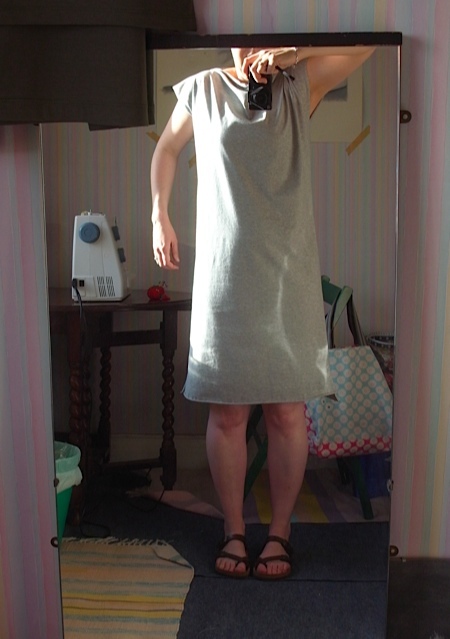 Right, first draft of the dress looked like this. Please don’t laugh! 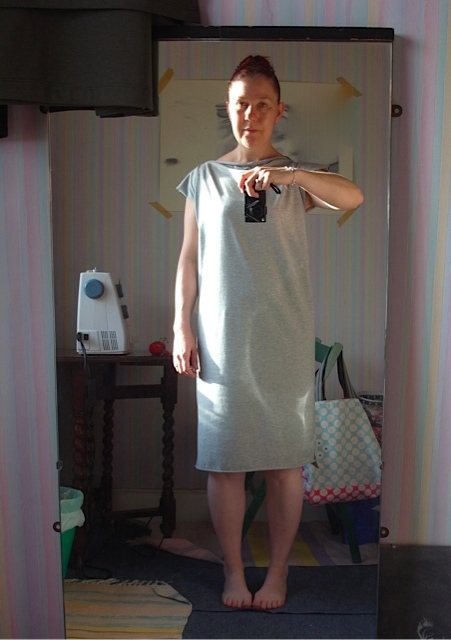 I’m well aware it makes me look like an inmate from a lunatic asylum……..
Its really difficult to work out exactly what length I want the dress to be. And when you are trying to do it on yourself you end up pulling poses like this……..
I’ve raised my shoulders in the hope it’ll help me decide. It didn’t really! I suppose it gives me a rough idea. I then decide to pin the hem at the length I think will be best (actually more luck than judgement). And BINGO! We have a winner. I then sew the hem in place, using my trusted twin needle. Which depending on the mood of the sewing machine, can go smoothly, or end up in a twisted mess of threads, unpicking and re-sewing, sometimes several times! Hem is now sewn in place, you may or may not be able to see that I’ve made it a nice deep hem, about 5cm deep in fact. I do like a deep hem. Haven’t ironed it yet either so its not sitting quite right, but I’m pretty happy with it. But don’t really like things round my waist. I sewed some fabric around the shoulders. Creates a gathering effect, gives the dress just a little more detail, and i think looks pretty cool. I’m loving it. 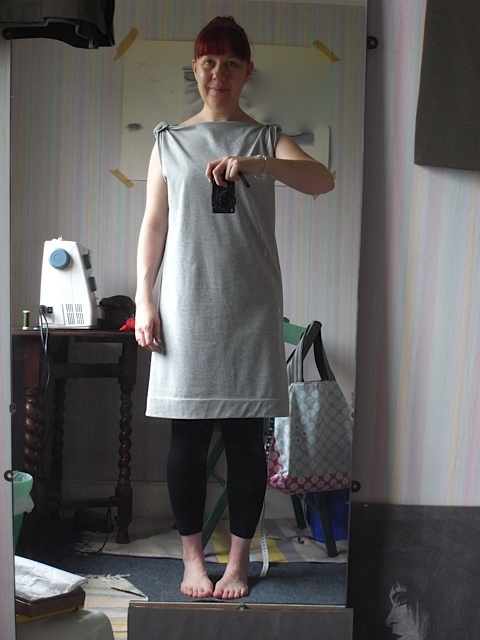 Plus if I get bored of it I can just unpick the bits of fabric and have the sleeves back. I think it even looks good on the hanger! Gone from, inmate of a lunatic asylum, to a perfectly presentable dress I can wear in Florence! I’m really really happy with this, I mean really HAPPY! 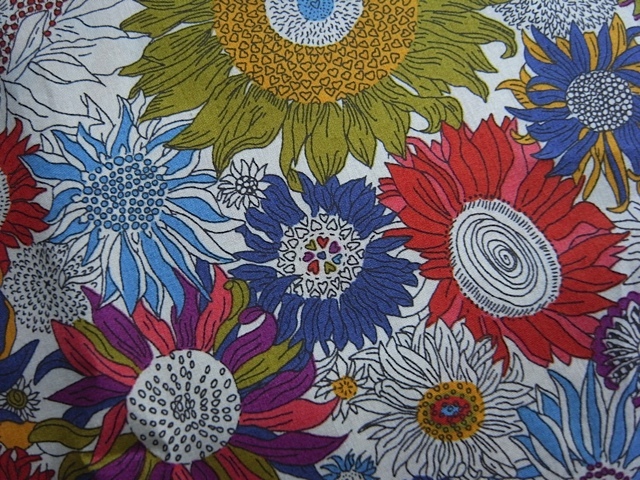 This time last year I hadn’t made my first cushion cover yet. And now my holiday wardrobe will be at least 50% homemade! Slap on the back for me. 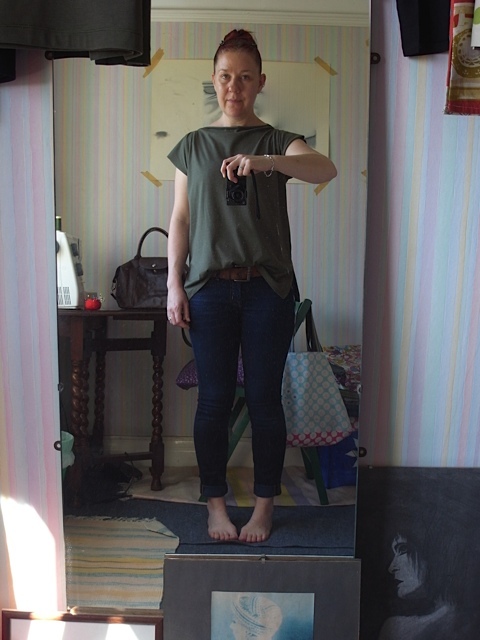 May 2014: Short Jersey top. I’m too excited not to share immediately! 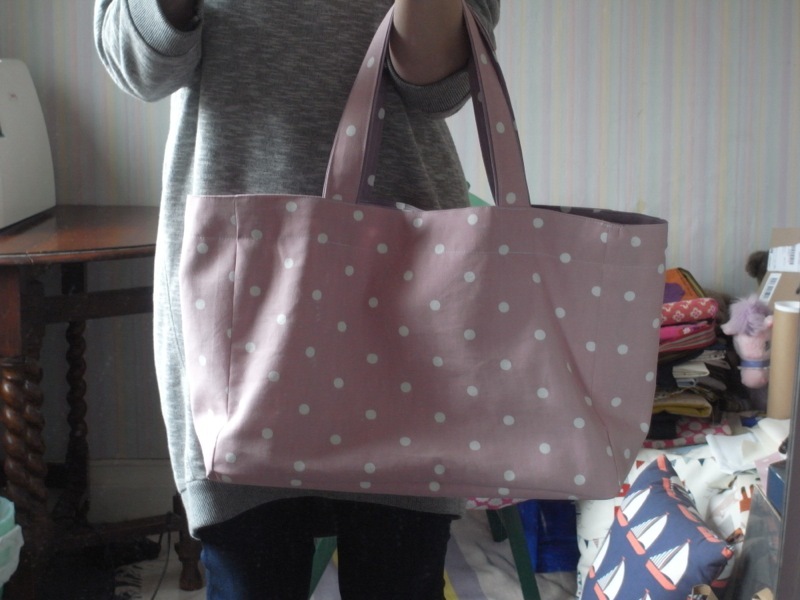 This bank holiday weekend I’ve done nothing but SEW! 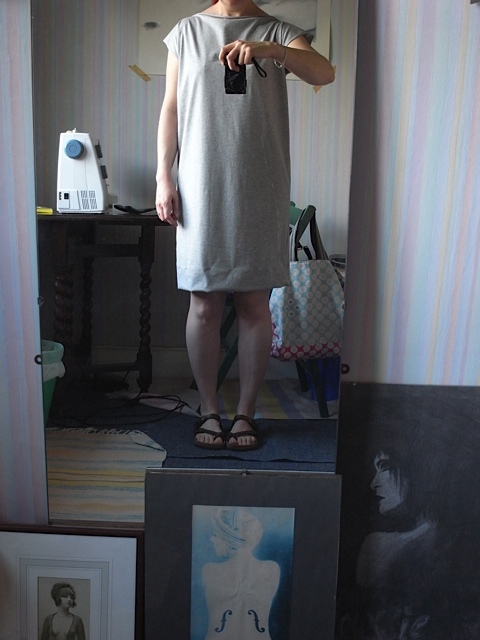 I’ve made 1 top and 3 dresses. 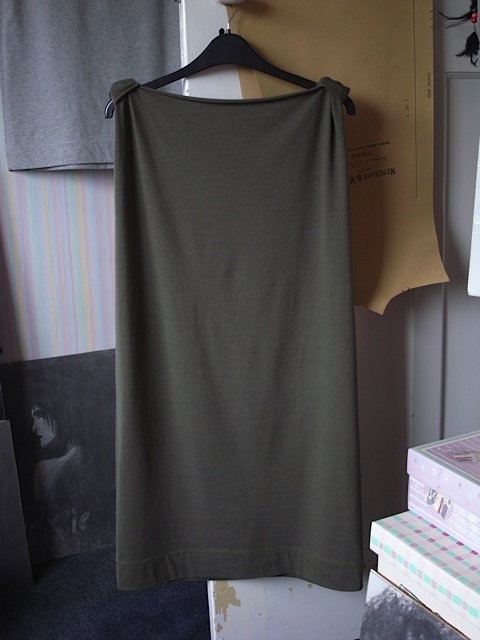 First up is the top, as the post bout the dresses will be quite long. 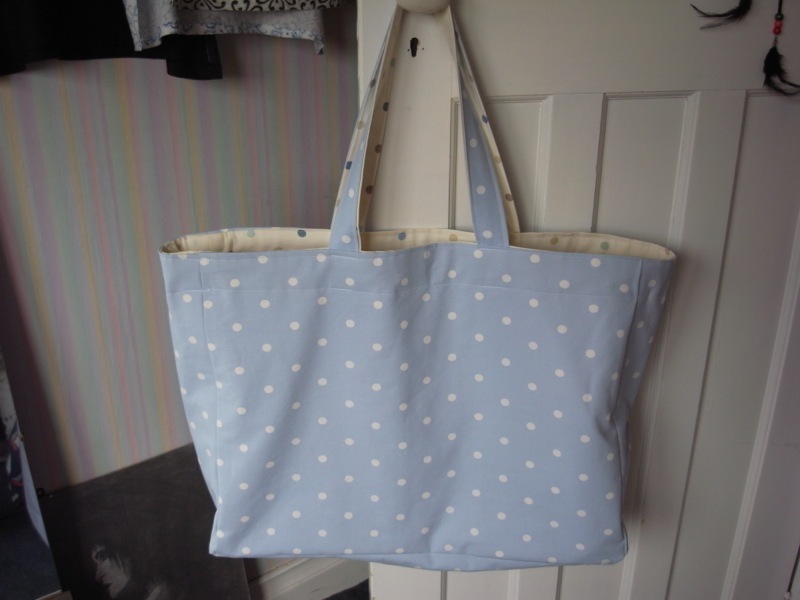 I made this with some lovely jersey fabric I got in Merchant & Mills, I mentioned in an earlier post. I just love jersey, it doesn’t fray, so it means you don’t have to finish the edges, nor do you have to be so meticulous with the seams. Which all goes to mean a faster making process. YAY! OK you lucky people, I’m putting my face in. Pretty sure the only people reading/looking at my blog are my friends anyway, and you all know what I look like. 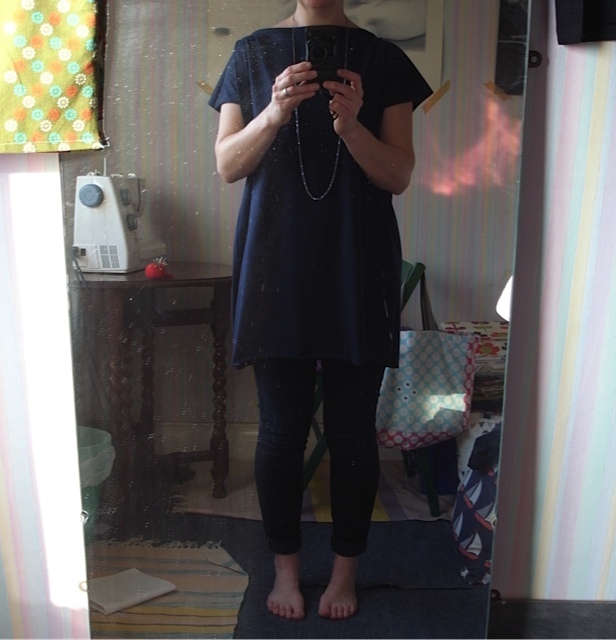 I’m really rather pleased with this top, might have to make another in navy. I am, I’m afraid one of those people who, when finds something I like, I buy it in multiples for fear that it will wear out and I’ll never find it again. So now, I can, and do, make things in multiples, for fear the fabric will become unavailable and I’ll never find it again. 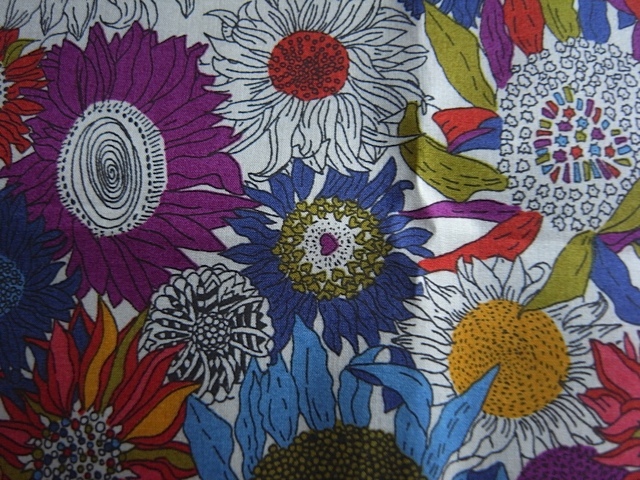 This is a really gorgeous fabric, feels so soft and silky. 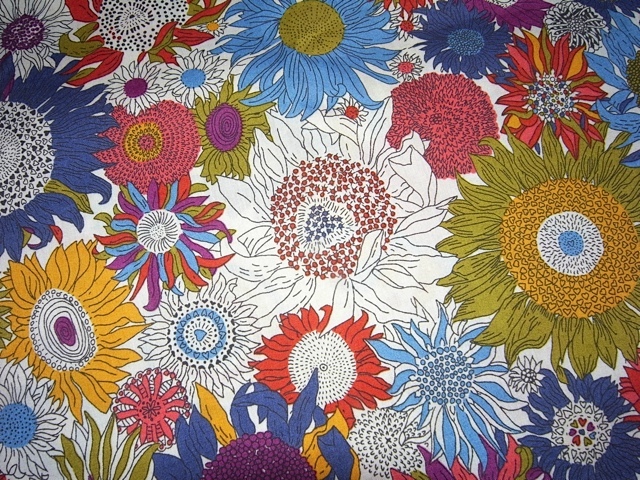 And the pattern is just wonderful, so much going on if you look closely. Lots of cute little details. There will now follow lots of pictures. I love the little details, like the hearts in the middle of the flowers. 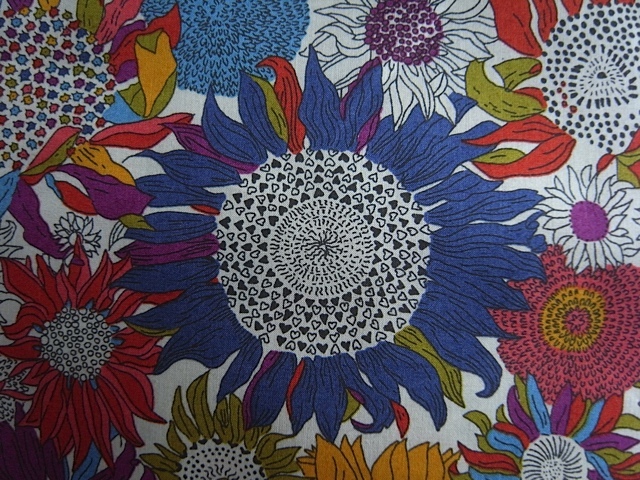 I can’t wait to make this into a top. 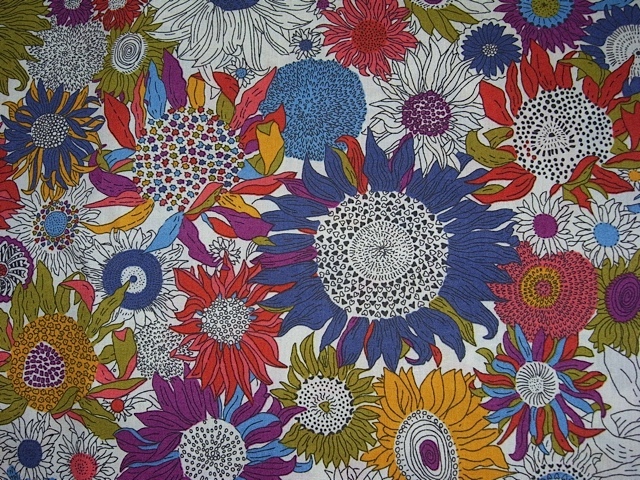 At £22 a metre its not the most expensive fabric I’ve bought but it still feels a bit special and I’m a little nervous. I really want to be able to do the fabric justice. I got some money for my Birthday which was the end of February, and I went to lunch with my friend Nona, to Rye. Whilst there I decided I needed to pop into M&M, as I wanted to check out their scissors or Tailors shears if you will. Now I wouldn’t normally spend over £50 on scissors but sometimes you just have to go for it. And when you have some birthday cash there really is no excuse. Also Nona was very helpful in talking me into the more expensive pair rather than the smaller less expensive pair. 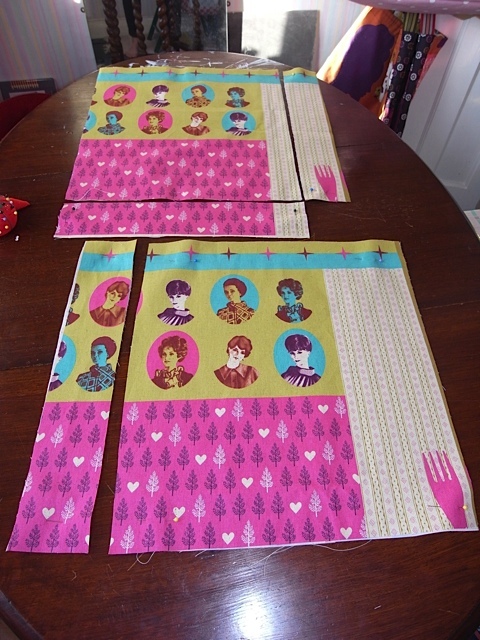 I was able to try them out before buying, as they gave me a piece of scrap fabric to cut up. I found them rather heavy and was unsure if I needed something so apparently tough and robust, I mean its only fabric! The scissors that I had been using appeared to have a nick in one of the blades, which meant I couldn’t take long cuts in the fabrics, which was quite frustrating ( these weren’t a cheap cheap pair, but certainly not expensive either) I thought they should’ve been a bit better than they were. So back to the heavy, expensive, but rather lovely pair. I was still undecided, but between Nona and the very lovely shop staff, I was persuaded. I parted with my Birthday money, but felt quite happy. 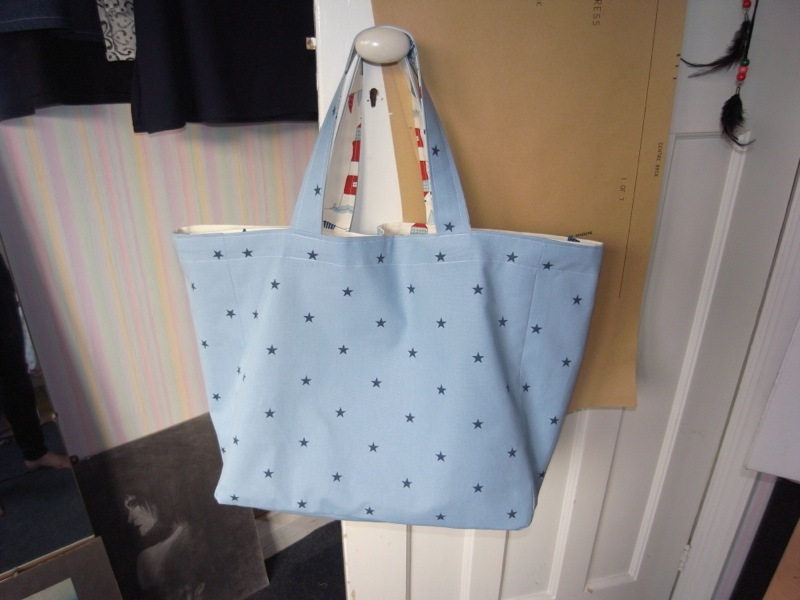 I also bought some gorgeous jersey fabric, in grey, navy and khaki green. I’ve been after some jersey fabric for a while now and this stuff felt simply divine. So soft . I bought a new tape measure too, as my previous one came out of a cracker. Not to say it was rubbish, it had held up well, but some of the numbers were coming off, and I fancied a new one. I have to say that the scissors are amazing, I love them. 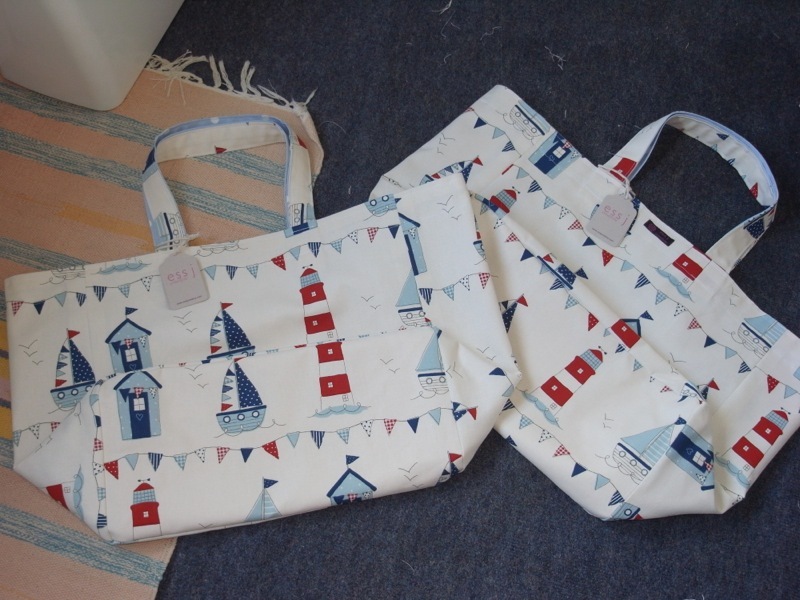 The first time I used them they did make my hand ache and my thumb got sore (I was cutting the fabric for the FLIPPING HUGE baby bag though, so I did an awful lot of cutting). They really are heavy, but I’m used to them now and don’t find them too heavy anymore. They feel sturdy and you can feel the quality. 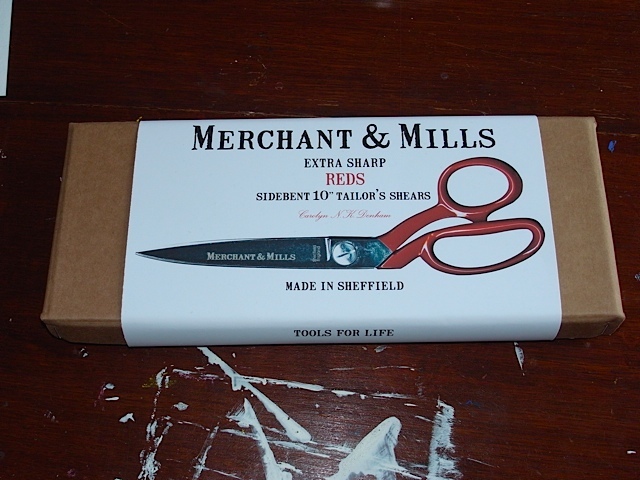 I occasionally pick up my old scissors by mistake (which I’ve kept for cutting threads and suchlike) and when I’m not expecting to pick them up, but am expecting my Merchant & Mills ones, the old pair feel so cheap and light. All in all I’m very happy I took the plunge. March has been a pretty productive month for me. 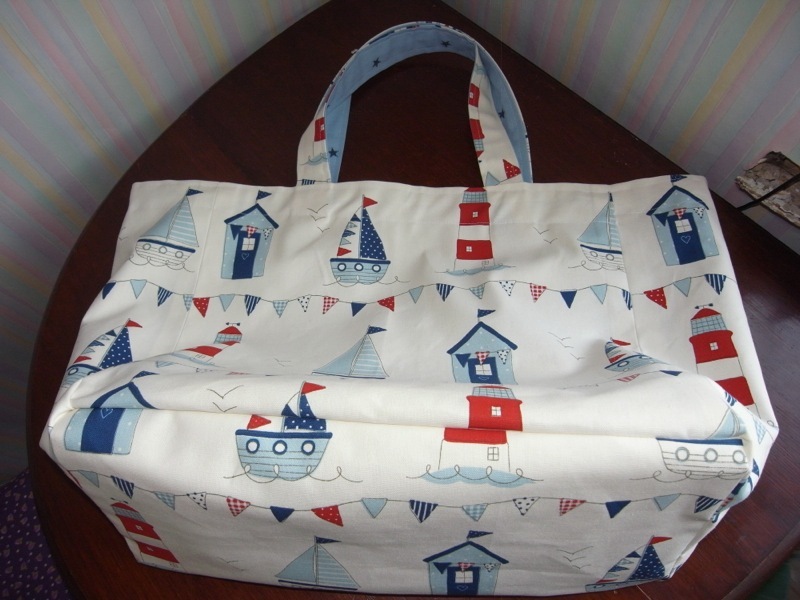 I’ve made quite a few bags for which people have paid me good money, can’t say I’m not happy about that. 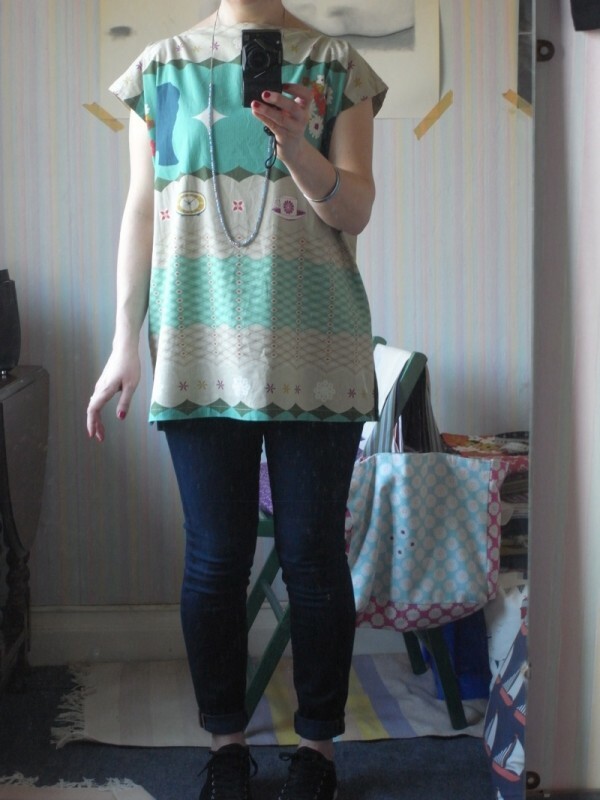 And I’ve also made some tops for myself. 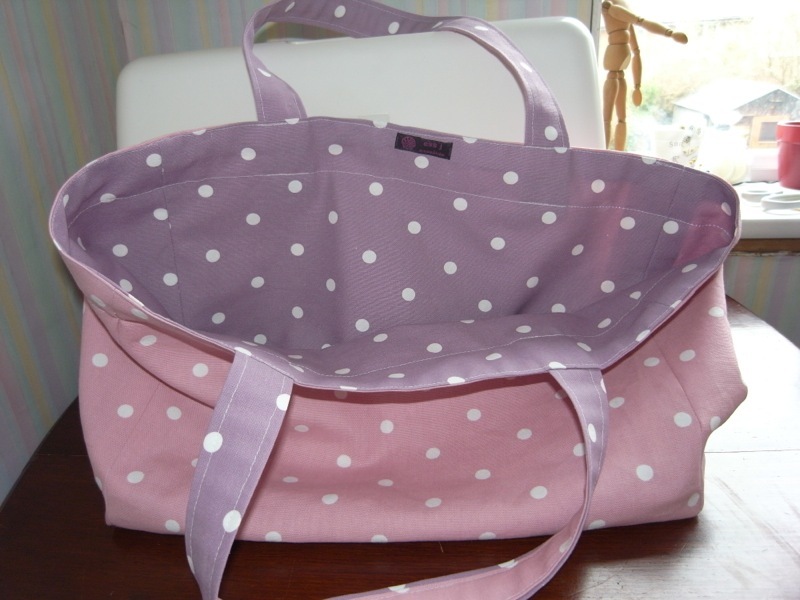 This is a FLIPPING HUGE baby bag! You could put several babies in it and it still wouldn’t be full! The person who had it though, was very happy with it. 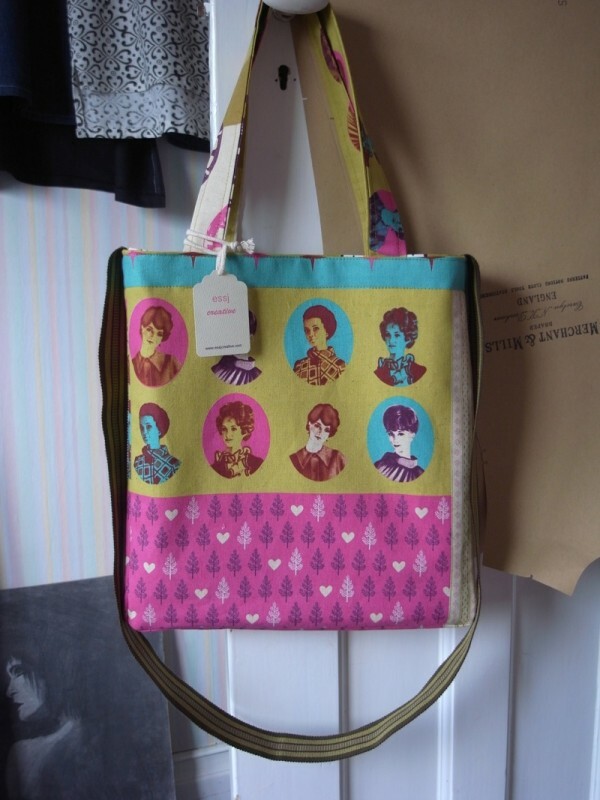 A very colourful bag. Went to a good home. Reversible. Also went to a good home. inside out! Or outside in! 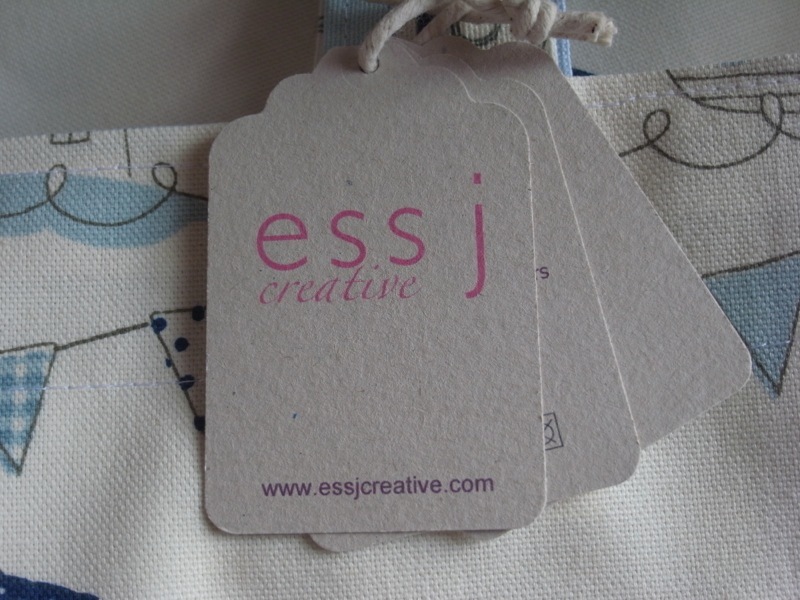 Lovely labels. Made by Amanda. February 2014: A lovely card . One of my lovely friends made this for me for my birthday. It also contained some money which I spent on some more gorgeous jersey fabric from Merchant & Mills. But more on that later. 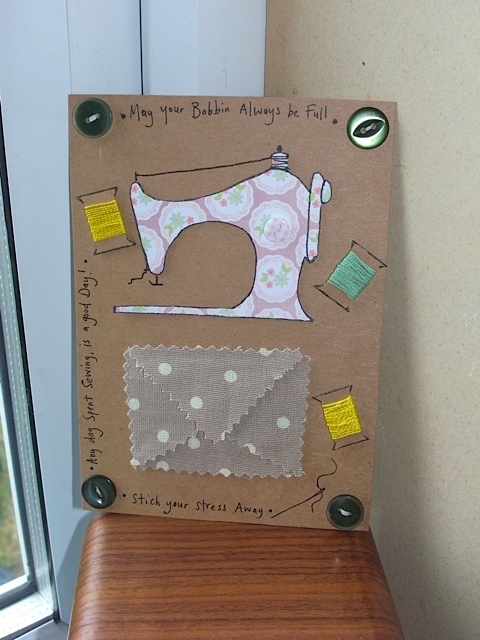 I love this card and the saying “may your bobbin always be full” is very close to my heart. I love a full bobbin and get a little anxious when it starts to get to the end. So I have a lunch date with some girl friends the day after my birthday and I want a new top. And it gives me great pleasure to be able to make it myself. 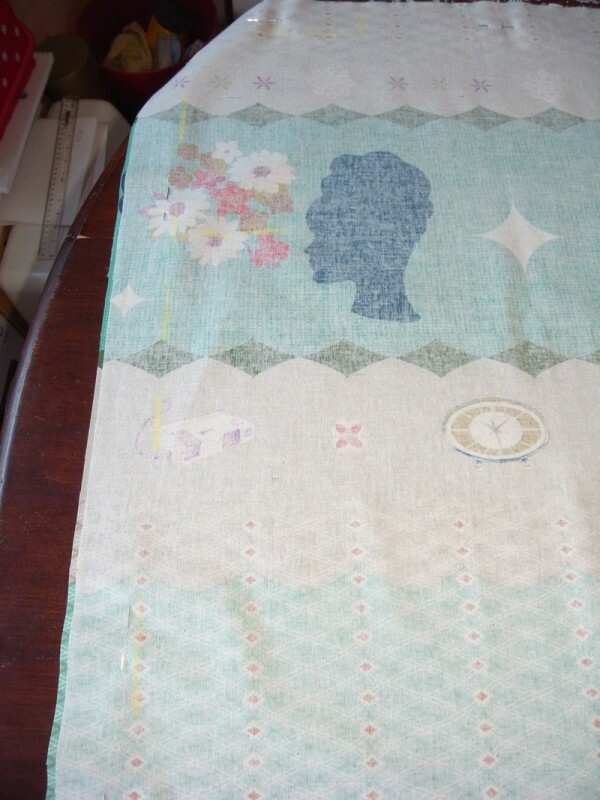 I had fun with this gorgeous Melody Miller for Kokka fabric. 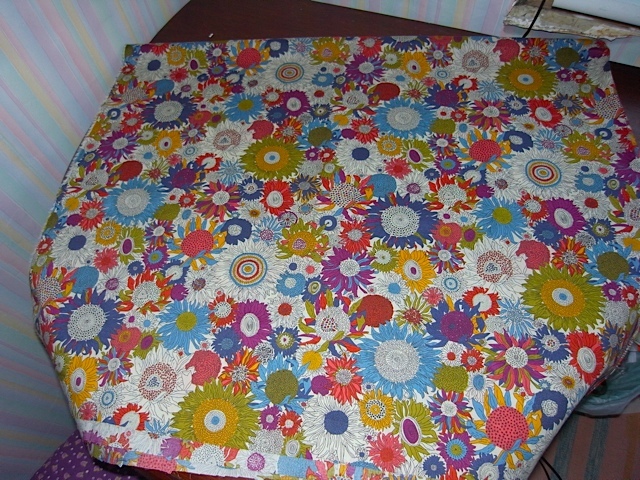 I got the fabric from the lovely Fabric-yard. 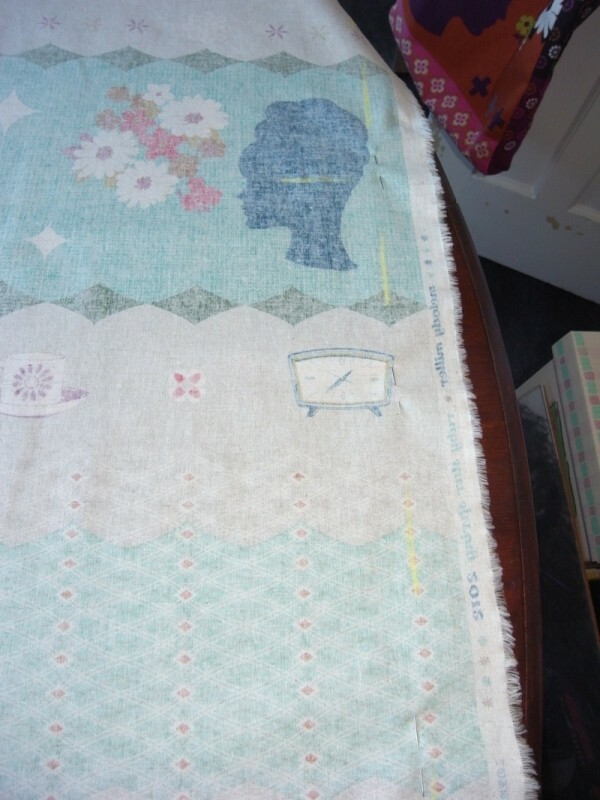 At £19 a metre it isn’t cheap, but the fabric is a lovely cotton/linen mix. It took me ages to decide where exactly I wanted the pattern to fall. 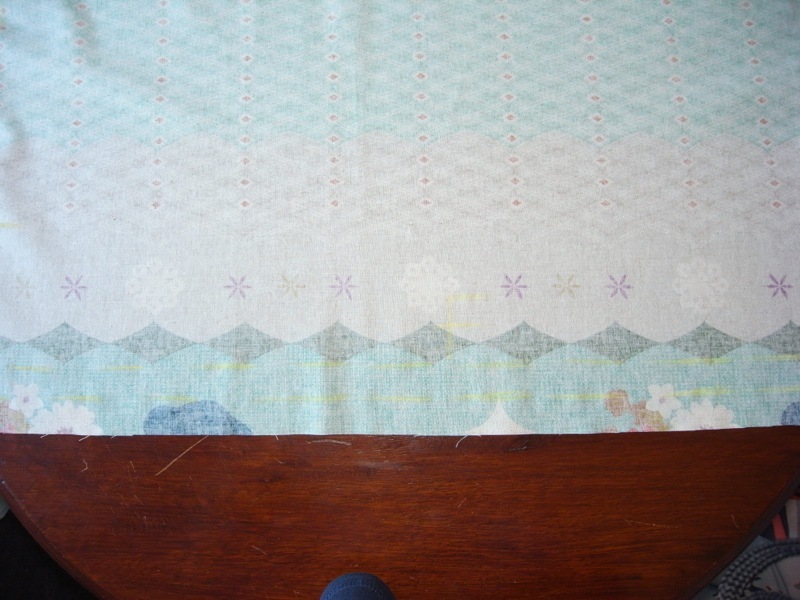 Pattern placement can really alter how a finished item looks and can make or break it. I’m really happy with how this turned out. 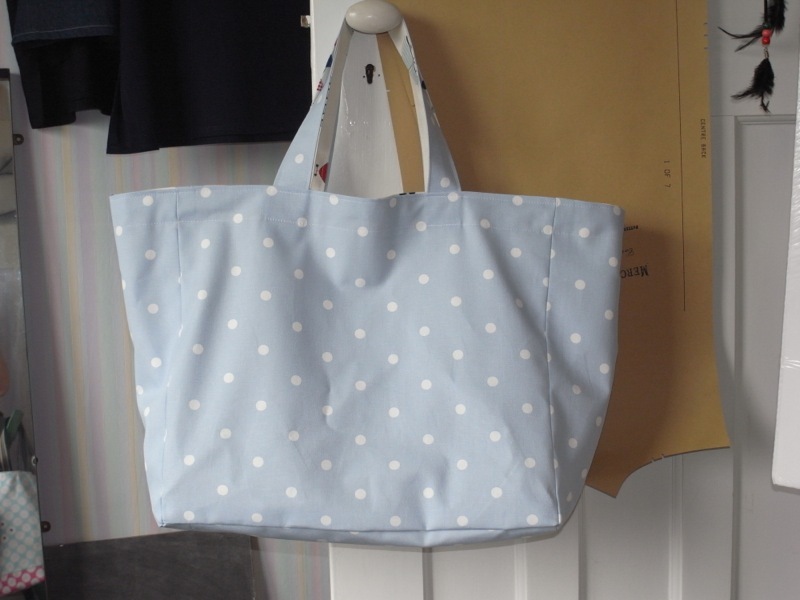 I surprise myself every time I make something, as I learn something new each time, and feel I improve on my finishing and therefore the overall quality of the item of clothing or bag. 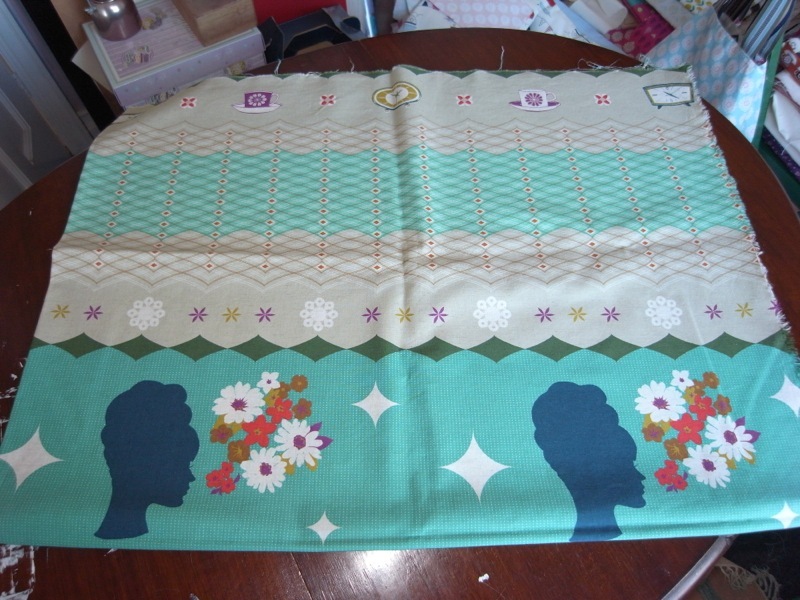 After deciding where I want the pattern design to appear on the top, I mark out my pieces. And due to the simple nature of my tops there are only 2 pieces. Nice and easy. 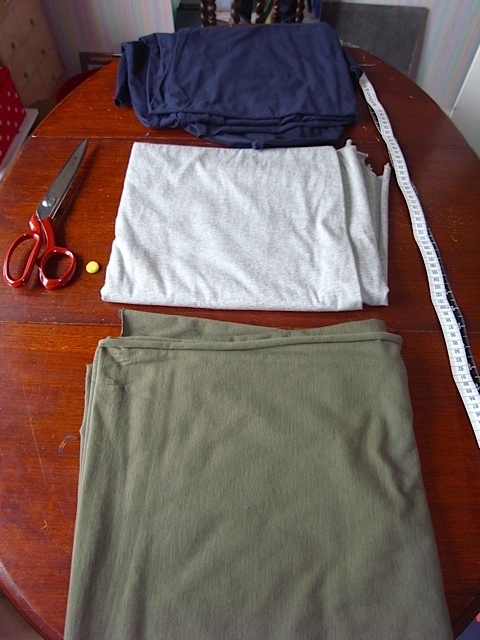 I then mark out the neckline, the shoulders, hem and seam allowance. 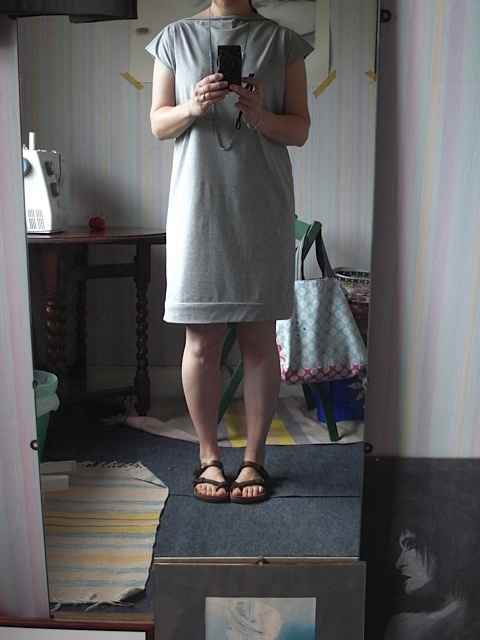 Now I’ve been pretty generous with the seam allowance on this top, I’ve used a 4cm SA. 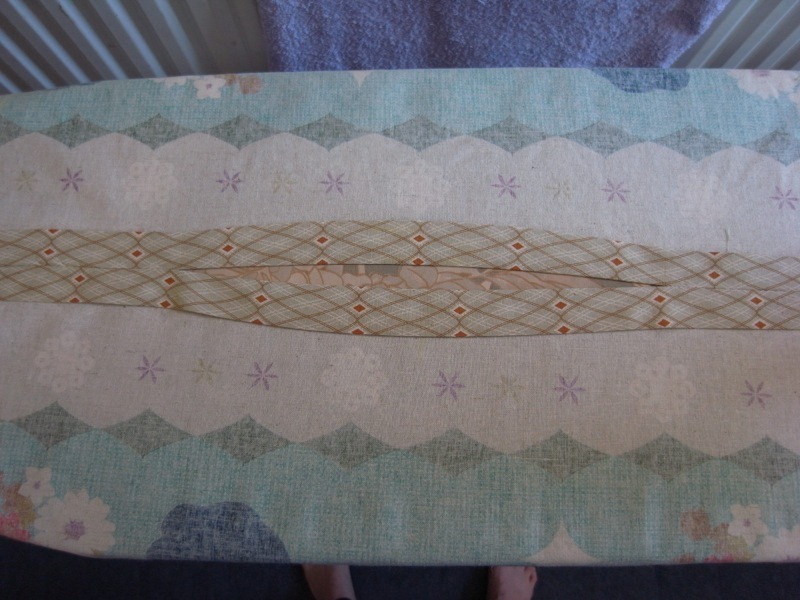 It makes it nice and easy to fold the seams over on themselves to give a much better finish. Neckline after joining the two pieces together. Inside out. Not sure how clear this is, but I’ve marked out the 4cm SA & armholes. The pieces of fabric are pinned together so i mark everything out the same on both sides. Finished. Been worn so its a little wrinkled! Pattern placement worked pretty well. Not 100% perfect but matches up quite well at the seams. 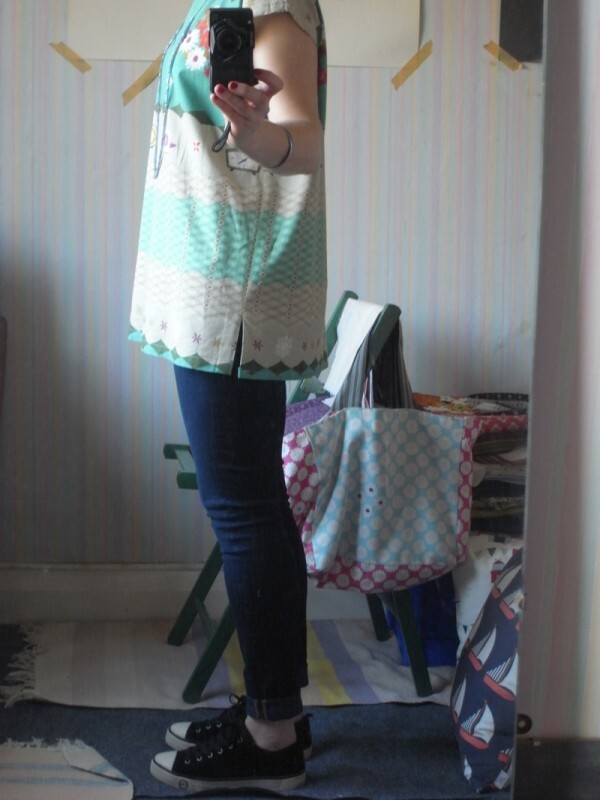 I love this top and am so happy with it. 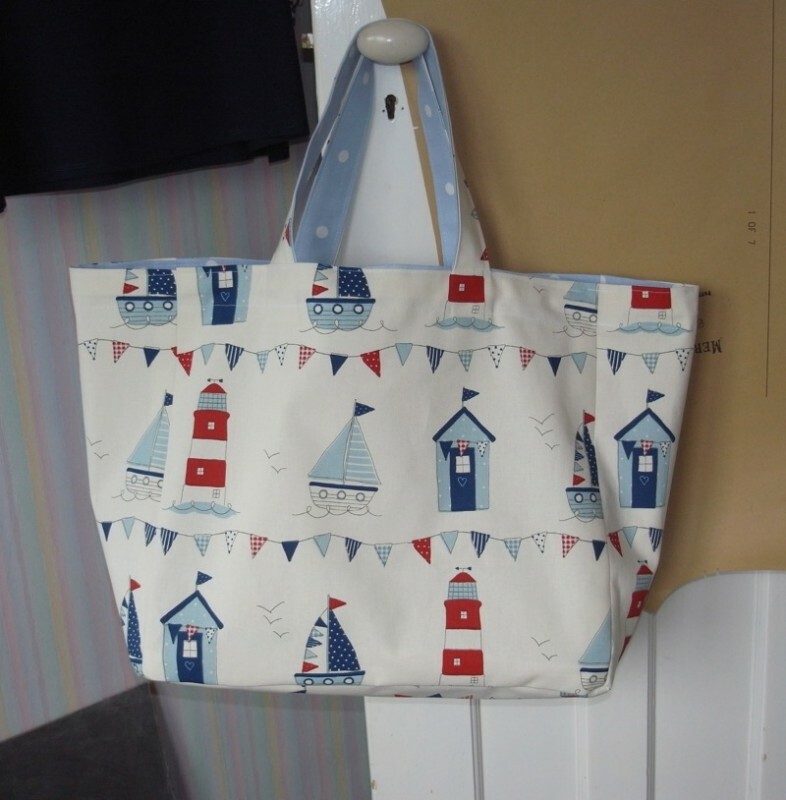 This is the sort of thing i like and find so difficult to find in the shops, so to be able to make something like this for myself gives me a really happy feeling.